The first widely adopted system for transmitting messages overland and first practical telecommunications system of the industrial age was developed around 1790 in France by Claude Chappe and his four brothers (Claude was one of eight brothers, but three of them died in infancy, so five survided: Ignace (1762-1829), Claude, Pierre (1765-1834), René (1769-1854), and Abraham (1773-1849)). Claude Chappe (see biography of Claude Chappe) was a person of noble descent (he was the grandson of a French baron), who after completing his studies at the Royal College in La Flèche, was appointed commendatory abbot, a sinecure that provided him with enough money to create a small laboratory, where he performed many experiments in physics. Chappe lost his position during the French Revolution, and in 1789 returned to his birthplace. Claude's brothers, had also lost their jobs and returned to Brûlon. In early 1790 the five Chappe brothers decided to set up a shop to work on visual telegraph (initially the device was called tachygraphe), using a telescope. The use of telescope in visual telegraphy had already been proposed by Robert Hooke over a century ealier, and later used by other inventors, like the French physicist Guillaume Amontons (1663–1705), who in 1690 demonstrated his system of telegraphy before the Dauphin in the garden of Luxembourg in Paris. The first telegraphic correspondence that we performed was done with two pendulum clocks, that were kept in perfect synchrony; the face of the clocks was divided into ten parts, each part designating a different number. When the pointer of one clock passed over the number one wanted to indicate, a sound was made, announcing to the correspondent that the number which also his pointer indicated at the moment that the sound was heard, was significant. By representing the words in a dictionary with successive numbers one could thus transmit any thought. At this short distance, the sound signals could still easily be heard, but it was clear also at that time that it would eventually have to be replaced if longer distances have to be covered. Abraham Chappe later wrote that Claude performed many experiments to find a good alternative, including the use of electrical signals through wires (the idea for communination based on static electricity, was abandoned because of the difficulties of insulation), and records that an optical method was only chosen (with black and white surfaces) …after having tried, unsuccessfully, electricity, various acoustical methods, the use of smoke produced by different types of combustible materials, etc. The first public demonstration was done on 2 March 1791. 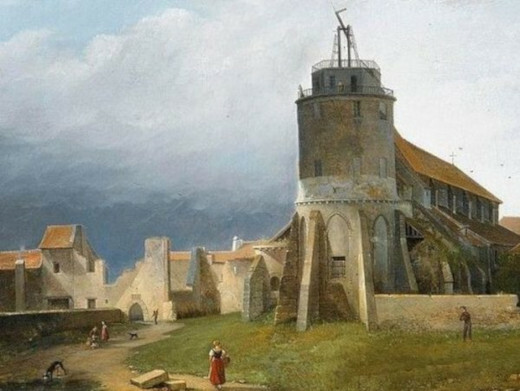 One of the devices was placed on a terrace at the former location of the castle in Brûlon (see the lower drawing), and the other at the window of a house in Parcé, a small town at a distance some 16 km from Brûlon. In the lower picture you can see an illustration of the first demonstration in a book from 1868—"Les Merveilles de la science ou description populaire des inventions modernes. Télégraphie aérienne, électrique et sous-marine, câble transatlantique, galvanoplastie, dorure et argenture électro-chimiques, aérostats, éthérisation", author Louis Figuier. At the invitation of Mr. Claude Chappe, we have gone to the house of Mr. Ambroise Perrotin, in the aforementioned city of Parcé, to observe the result of an invention intended to communicate and correspond in the shortest amount of time. First, we were led into a room of the said house, by the said Mr. Claude Chappe, and we found there a pendulum clock, and a telescope pointing in the direction of Brûlon, 4 leagues distant from Parcé. Next, the said Mr. Claude Chappe aimed the telescope directly at Brûlon, announcing that even though the weather was rainy, his correspondent at Brûlon would proceed by initiating a transmission that would be dictated to him by the municipal officers at that site; and while continuously keeping his eye at the telescope, he successively, within the space of four minutes, dictated to Mr. Pierre Francois Chappe, his brother, various characters, unknown to us. By translating these characters, the following phrase was produced: Si vous réussissez vous serez bientôt couvert de gloire [If you succeed you will soon bask in glory]. Done and attested to in Parcé, at the house of the said Mr. Perrotin, before midday, at said day and year. First, we went with Mr. René Chappe, brother of Mr. Claude Chappe, to the terrace at the castle, and there we found a pendulum clock and a movable tableau, with two sides, one being white and one black. Next, Mr. René Chappe informed us that Mr. Claude Chappe was at that time at Parcé, at a distance from Brûlon of 4 leagues, to receive what he was about to transmit. He asked us to dictate a phrase to him, or any series of phrases of our choosing. In response, Mr. Chenou, doctor, proposed the following phrase: Si vous réussissez vous serez bientôt couvert de gloire. Immediately, said Mr. René Chappe, after pointing out to us that the weather was rainy, and that the atmosphere was obscured by a light mist, contemplated said phrase, and proceeded to transmit it while moving the tableau in various ways, which lasted four minutes. He then told us that the said phrase had actually been transmitted to Parcé; as an inspection of the notary report, drafted by the municipal officers at that location would demonstrate. After the successful demonstration, the hard road to success really began for Chappe in their attempt to secure government funding for the construction of a telegraph network. Luckily, Ignace Chappe was elected to the new Legislative Assembly in Paris. He became a Deputy to the Assembly in October 1791, and a member of the Committee for Public Instruction, which had an important advisory role in the consideration of new inventions. I have come to offer to the National Assembly the tribute of a discovery that I believe to be useful to the public cause. This discovery provides a simple method for rapidly communicating over great distances, anything that could be the subject of a correspondence. The report of an event or an occurrence could be transmitted, by night or by day, over more than 40 miles in under 46 minutes. This transmission takes place almost as rapidly over a much larger distance (the time required for the communication does not increase proportionally with the distance). I can, in 20 minutes, transmit over a distance of 8 to 10 miles, the following, or any other similar phrase: "Lukner has left for Mons to besiege that city. Bender is advancing for its defense. The two generals are present. Tomorrow the battle will start." These same phrases are communicated in 24 minutes over a distance twice that of before; in 33 minutes they cover 50 miles. The transmission over a distance of 100 miles requires just 12 minutes more. Among the many useful applications for which this discovery can be used, there is one that, under the present circumstances, is of the greatest importance. It offers a reliable way of establishing a correspondence by which the legislative branch of the government could send its orders to our frontiers, and receive a response from there while still in session. My assertions are not just based on a simple theory. Many successful experiments, held at a distance of 10 miles, in the Sarthe department, are for me a certain guarantee that this can be accomplished. The attached affidavits, drawn up at two municipalities, in the presence of a range of witnesses, attest to its authenticity. The obstacle that seems to me to be the most difficult to overcome is the popular suspicion that usually confronts those who pursue projects such as these. I could never have escaped from the fear that has overtaken them, if I was not sustained by the conviction that I should, as every French citizen, today more than ever, contribute to his country what he can. 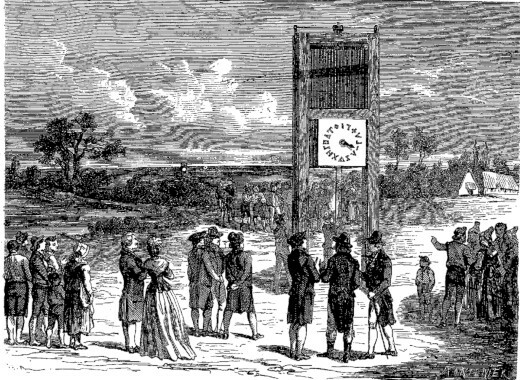 I ask, Sirs, that the Assembly submit to one of its committees the examination of this project that I have the honor to announce to you, so that they can appoint delegates to observe the results of an experiment readily performed at a distance of 8 to 10 miles, and convince themselves that the same can be accomplished at any distance. I will perform this experiment, and in addition, at any distance that is requested, and I ask only, in case of success, to be reimbursed for the expenses that are made. 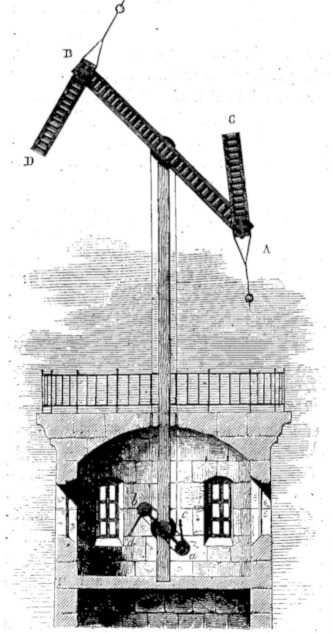 Not satisfied with the experiments of the pendulum system, in the summer of 1792 Claude Chappe started experimenting with a different design. It included a rectangular wooden frame with 5 sliding panels that could be displayed or obscured individually with pulleys. The five panels produced a five-bit binary code (with 32 possible combinations), more than three times as many codes as used in the first design. In September 1792 Chappe was ready to perform a demonstration to the Assembly. Unfortunately the Legislative Assembly was disbanded that month, and replaced with a National Convention. 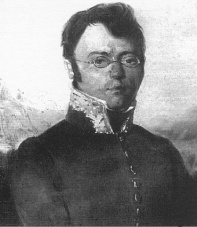 Ignace Chappe was not re-elected to the new body, so part of Claude's influence was lost in the transition, but he keep to send proposals and letters to the Convention. Some time later we established with certainty that elongated objects were better visible than the sliding panels adopted before. The third design of Chappe, so called semaphore telegraph (see the nearby image), consisted of a large horizontal beam (regulator), with two smaller wings (indicators), mounted at the ends (just like a person with wide-outstretched arms, holding a signal flag in each hand). The angles of the indicators, and independently also the position of the large regulator beam, could be varied in increments of 45 degrees, sufficient for the encoding of hundreds of symbols. Luckily, Chappe had found a few allies in the legislative bodies, and on 12 July 1893, a successful official test was held. Three locations that had been selected, were: Belleville, the heights of Ecouen at 15 km north of Belleville, and the town of Saint-Martin-du-Tertre, another 11 km further north. Within 11 minutes the message was transmitted, from Belleville, through Ecouen, to Saint-Martin-du-Tertre, the answer arrived 9 minutes later. From this moment, things moved very quickly. On 26 July 1793 the decision was made to establish a French state telegraph. On 4 Aug 1793 the Convention approved 58400 francs for the construction of a first line of 15 stations from Paris to Lille, some 190 km north of Paris. On 24 Sep 1793, the Convention gave blanket permission to the Chappes to place telegraphs in any belfries, towers, or emplacements of their choosing. They also had permission to remove any trees that interfered with the line of vision between the stations. 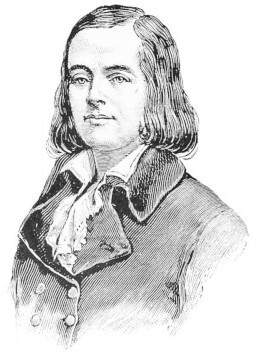 Claude Chappe was given the title of Ingénieur Télégraphe, a salary of 600 francs per month, and the task of construction and maintenance of the later Telegraph Administration. Permission was also granted for him to hire personnel, and to draft the first rules and regulations for the French telegraph. At Claude's request, his brothers Ignace, Abraham, and Pierre Francois were appointed as administrators of the line to Lille, at 500 francs per month each. In the revolutionary atmosphere which prevailed in France at this period, it is not surprising that Chappe's conspicuous experiments earned him the suspicion of the fanatical crowds and on two occasions the apparatus which he had set up at the Etoile was torn down and destroyed. Despite all, in July 1794, less than one year after the decision of the Convention, the connection between Paris and Lille was opened. In August the first official message passed along this line from Lille to Paris, reporting recapture of the city of LeQuesnoy from the Austrians and Prussians. The message arrived in Paris within a few hours after the battle had taken place, and the officials were impressed. The reputation of both the optical telegraph and of its creator were firmly established, and the future of the French telegraph network was guaranteed. In October 1794 a decision was made to build a second line, to connect Paris to Landau via Metz and Strasbourg. Despite the success, Chappe was not satisfied with the performance of the semaphore telegraph. The time to transmit messages was longer than he had expected, and the relatively poor visibility of the stations caused too many transmission errors. Several ways were considered to avoid the problems. First, Claude decided to have extra stations built along the line, to be included in the transmission chain when visibility was low. Second, he proposed to enlarge the regulator from roughly 4 meters to close to 15 meters to improve its visibility. Third, he considered the recommendation of the French mathematician Gaspard Monge for increasing the number of arms from 2 to 7, to increase the code space and hence the speed of transmission. However, Claude finally came to the conclusion that the problem with the semaphore telegraph was not its size or the number of indicators, but an inadequate signaling code. Thus, between 1794 and 1795 he developed a new coding system that alleviated much of the problem. Despite the numerous obstacles, the beginnings of a network became visible around 1800. Telegraph stations were built roughly 10 km apart. A telegrapher in the next tower would read the semaphore signals through a telescope and retransmit the encrypted message to the following tower. Initially the average speed of the transmission was 2 to 3 symbols per minute, but sometimes much better speed was achieved, e.g. from Paris to Lille (22 stations), they could receive communications in two minutes. Certainly, the speed depends on reliability of message transmissions, i.e. from weather conditions, e.g. messages would get through on the first try an average of 97% in August, but only 16% in December. To simplify the administration and the reliability, each line was divided into short, autonomous segments called divisions. At the start and end of every division all messages were to be completely decoded and recorded in logbooks by an inspector, before being passed on. The operators at intermediate stations were allowed to know only a small subset of the telegraph code: the control codes that preceded and followed the actual messages, and the occasional error codes that could be inserted into them. They did not know the code used for enciphering the actual messages. That authority rested solely with the inspectors of the lines, and the director and assistant directors of the Telegraph Administration. Sadly, Claude Chappe did not live long enough, to enjoy the (more or less) successful implementation of his plans, as on 23 Jan 1805, he killed himself. He was said to be depressed by illness, and his natural tendency to melancholia was apparently deepened by the claims by rivals that he had plagiarized from their communication systems. After Claude's death his brothers continued working for the Telegraph Administration, with the strong support of the government. As early as in 1801 Napoleon commissioned the youngest brother, Abraham Chappe (see the nearby image) to develop a telegraph that could signal across the English Channel, to facilitate a possible invasion of England. In 1812 Abraham was commissioned again by Napoleon, this time to develop a mobile version of Chappe's telegraph that could be deployed during the invasion of Russia in that year. His design was still in use in 1853 when the Crimean War took place. The Chappes had achieved a position of power and relative independence in the administration and operation of the telegraph network. When Louis XVIII was restored to the throne in 1814, the three brothers Ignace, Pierre, and Abraham were given the rank of Chevaliers de Légiond 'Honneur. Before long, the first documented communication fraud was discovered, on the Paris to Bordeaux line. In 1834 two bankers, the brothers Francois and Joseph Blanc, had bribed the telegraph operators at a station just behind Tours to introduce a specific pattern of errors into the transmissions, to signal the direction in which the stock market was moving in Paris to an accomplice in Bordeaux. The fraud had been in operation for more then two years before it was discovered in 1836. 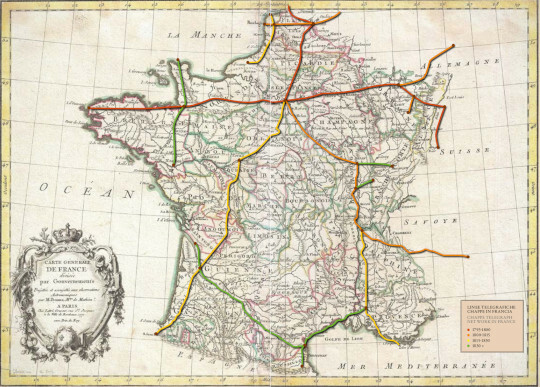 By the advent of the electric telegraph (1852) the French network of optical telegraphs had grown to 556 telegraph stations, covering some 4800 km (see the upper map). The network connected 29 of France's largest cities to Paris. The most detailed contemporary information on Chappe's designs is contained in a book by Ignace Chappe, Histoire de la télégraphie, published in 1824 (see the book digitized by Google from the library of the University of Michigan).